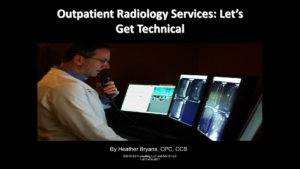 In this session, we’re going to get technical about outpatient radiology services. Some review organizations have gotten technical too and have made this topic part of their focus. We won’t be discussing specific codes for reporting; but rather, we will be digging deeper into the technical billing requirements and issues that affect reporting of radiology services. Utilize learned information to make logical decisions regarding modifier use for radiology services. Describe how and why radiology services are a focus of reviewers. Describe key denial issues with radiology claims and apply the knowledge to assess internal processes. Examine the top denial reasons and review focus areas for external reviewers such as the RAC’s. This course authored by Heather Bryans and Paula Digby.